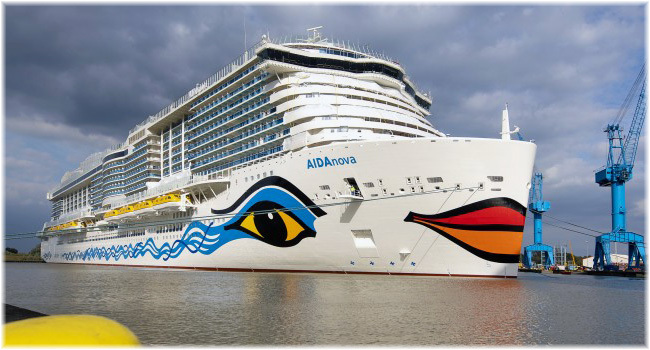 The 183,900-ton vessel will be the first North American-based cruise ship to use LNG, and will introduce a new hull-painting design and modified livery. The new red, white and blue hull look is intended to emphasise that Carnival is “America’s cruise line.” Developed by New York-based Bluarch Architecture, the design builds on Carnival’s longstanding colour scheme and is highlighted by a stately navy blue forward hull with red and white accents that run the length of the 1,130-foot ship. In some ways, this will resemble the new colour scheme being introduced by Hapag-Lloyd Cruises on its “Hanseatic Nature” class trio of expedition ships. Carnival XL’s actual name will be revealed later this month and the ship will be delivered in 2020. She will be based at Port Canaveral. “This new ship promises to be truly special, from its groundbreaking technology and one-of-a-kind features to its distinctive livery and hull design that is both timeless and forward-thinking while paying tribute to our nearly fifty-year history of making wonderful vacation memories for our guests,” said Carnival president Christine Duffy. Not only will she be the largest Carnival “Fun Ship” by gross tonnage, she will have 5,286 lower berths. Considering that Carnival routinely fills third and fourth berths, the actual passenger load will be much higher than this. Construction of the second Carnival XL vessel will commence in 2020 for delivery in 2022, the 50th anniversary of Carnival’s founding. 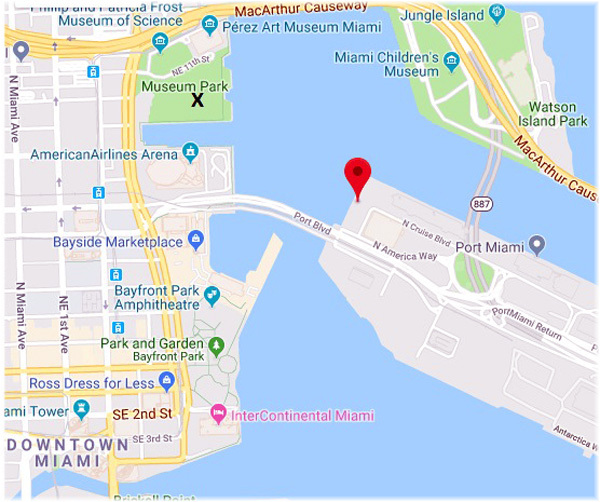 A new Virgin Voyages cruise terminal is to be located at the newly-named Palm Grove, on the northwest side of Miami’s cruise port on Dodge Island. 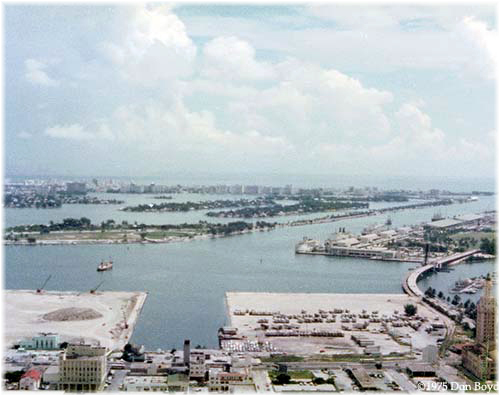 This will give Virgin the closest views of the Miami skyline and Museum Park, which was once the location of the old pre-1960s cruise docks. The design for the new 10,000 sq ft $150 million cruise terminal was inspired by Miami Beach’s iconic palm trees and developed by the Coconut Grove-based design firm Arquitectonica. The concept builds on Virgin Voyages’ design ethos of the modern romance of sailing, a new take on the formal grandeur and opulence of the ocean liner heyday. Indeed, Virgin intends to eliminate the buffet and many of the boring clichés attributed to cruising today. The roof of the new Virgin terminal is designed to resemble a palm tree grove. And pockets will allow natural light to flow into the building by day and illumination by night will light up the company’s iconic red Virgin Voyages logo atop the building. 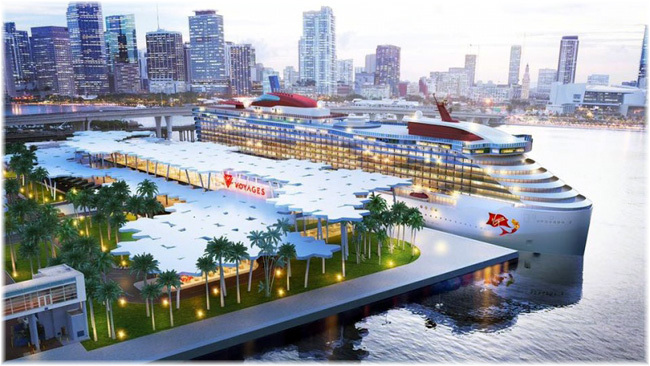 Virgin Voyages joins three other cruise lines in developing new terminals in Miami. Royal Caribbean celebrated the opening of its new Terminal A last month, while Norwegian Cruise Line and MSC Cruises are also building new terminals, scheduled to open in the autumn of 2019 and autumn of 2022. Pending final approval, construction of the new Virgin terminal is set to begin next year and is scheduled for completion by November 2021. Virgin’s first ship, the 2,770-berth Scarlet Lady, now under construction by Fincantieri, is due to be completed in 2020. America’s last authentic overnight steamboat may once again return to service on the rivers of America’s Heartland and Deep South. Last week, the US House of Representatives voted to reinstate an exemption allowing the Delta Queen to return to service after a decade of lay-up. Beginning in 2020, the Delta Queen Steamboat Co intends to offer themed voyages on the Mississippi, Ohio, Tennessee, Cumberland and Arkansas Rivers. The 176-berth vessel will meanwhile undergo an extensive renovation at the Gulf Island shipyard in Houma, Louisiana. The same yard is working on the 245-berth sternwheeler American Countess for American Queen Steamboat Co.
“Preserving the boat’s historic integrity and ensuring passenger safety are our priorities,” said Cornel Martin, president and ceo of Delta Queen. “With this approval, we may now move forward with our renovations and return her to the waterways.” Outside observers reckon this will cost about $12 million. In 2008, the Delta Queen was withdrawn from service after her Congressional exemption from the 1966 Safety at Life at Sea Act expired. The law was intended to prohibit vessels from carrying overnight passengers unless completely made of non-combustible materials, The Delta Queen, however, was never more than a few hundred yards from shore. Congress approved nine exemptions over four decades to allow the Delta Queen to continue operating until 2008. The latest vote completes a decade-long legislative effort to renew the exemption. Once signed into law by the President, major repairs will begin..
“We are thrilled the Delta Queen will be restored to her original grandeur and returned to our riverfront,” said Mayor Philip Stang of Kimmswick, the vessel’s new home port, about twenty-two miles south of St Louis. The Delta Queen is a National Historic Landmark and on the National Register of Historic Places. She is also included in the National Maritime Hall of Fame and was named a National Treasure by the National Trust for Historic Preservation. The project is being supported by several local legislators, namely Ohio Congressman Steve Chabot, Missouri Senators Claire McCaskill and Roy Blunt, and Missouri Congressmen Blaine Luetkemeyer and Jason Smith, as well as Missouri’s Jefferson County, Port Authority and Economic Development Corporation. The original Delta Queen Steamboat Company was founded in 1890 and until 1973 was known as Greene Line Steamers. The new company is made up of several long-time supporters and former employees of Delta Queen.